Bird Watching the Hula Valley is one of the most important stops on any bird-watcher’s list, with thousands of migrant birds, of all varieties, stopping in for the winter. Lake Agmon occupies part of the area once covered by the original Hula Lake and is today an internationally-recognized ornithological site. A variety of projects have been designed to provide visitors with the best opportunities to enjoy the varied bird life in the valley. The Hula Valley – Israel – Natural Wonder. On the south side of the lake, close to islands that are used as hatching and wintering grounds by various types of ducks and as breeding areas for fish, a bird-watching lookout was developed. It extends into the lake, offering close views of the wildlife. It provides visitors with an unparalleled opportunity to enjoy Israel’s outstanding bird life from close up. The lookout’s unique plan allows visitors to watch the birds without disturbing them, and develops their awareness of wildlife and how we can protect and preserve it. Another project aimed at developing environmental awareness is the Bird Ringing (Banding) Station in the valley, which serves researchers studying the birds in Lake Agmon and its surroundings. At ringing stations birds are trapped, their vital data is recorded, and then they are ‘ringed’ (banded) with individually numbered aluminium rings. Visitors can watch ringing activity and learn about the birds returning to the restored valley and bird migration in general. Together with the Society for the Protection of Nature in Israel, KKL-JNF chose a suitable spot in the southern part of Lake Agmon and built the new ringing station with ‘hide-outs’ that allow birdwatchers to observe the birds without disturbing them. Importantly, young people are extremely involved and are encouraged to be involved in operating the Bird Ringing Station. Bird Ringing in the Hula Valley. GAIA (Global Awareness, Investigation and Action) Environmental Youth Collaboration Program completed its eight-week agenda in March (2013) with a four-day investigative trip to the Galilee and Negev. The focus of the trip was on scientific discovery regarding biological pest control. Participants included students from five schools in Israel as well two partner schools from the Czech Republic. Leading the trip was Dr. Stuart Fleischer, Director of Project GAIA and Dr. Motti Charter of Haifa University. Nofey Gonen Holiday Village local accommodation. 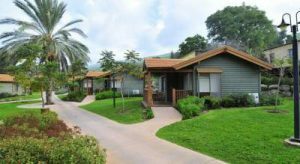 Nofey Gonen Holiday Village is set at the feet of the Golan Mountains, with beautiful views of Hula Valley and Upper Galilee. It offers air-conditioned accommodation with fridge and kettle. The Holiday Village is part of a kibbutz in the north-eastern part of the valley. Parking is free and guest have free use of the common swimming pool. Holiday Village Nofey Gonen is comprised of studios, apartments, and chalets with kitchenette. Free Wi-Fi is available at reception. The Hula Valley is one of the most important stops on any bird-watcher’s list, with thousands of migrant birds, of all varieties, stopping in for the winter. About 100 million bird watchers wander the globe with binoculars hanging round their necks, trying to add another rare specimen to their lists. 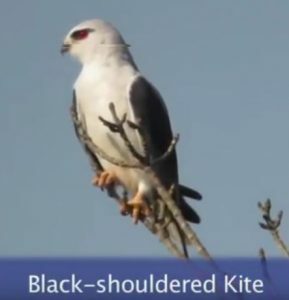 Dan Elon is excited because a black-winged kite was sighted nesting in Israel – for the first time. 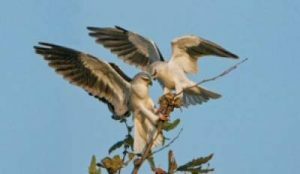 The black-winged kite, a white bird with piercing red eyes and yellow legs, generally nests in the southern hemisphere, but apparently climate change has led it to nest here. Black winged kites in the valley. 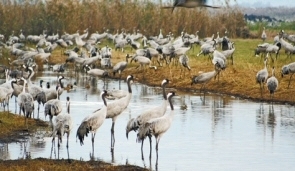 A Winter of Birds, the Hula Valley International Bird Festival, opens 24-11-11 and its events, centering on migrating birds, will continues for weeks. Elon, who heads the bird-watching center of the Society for the Protection of Nature in Israel, says the festival’s scientific conference will focus on the migrant birds’ stopover sites. These are key areas or hot spots, Elon says, on their routes, and scientists invest much effort in understanding their tremendous significance as places where hundreds of millions of birds concentrate in high season, at the beginning of winter and summer. The number of migrating fowl is constantly declining, a trend which worries researchers. The number of birds overall, in contrast, is rising swiftly. In the U.S., 20 million people have declared bird watching their favorite hobby, and that figure is expected to soar as the baby boomers retire. Birds use their rest sites to eat and prepare for their arduous journey, covering thousands of kilometers from northern Europe or North America to the southern hemisphere. 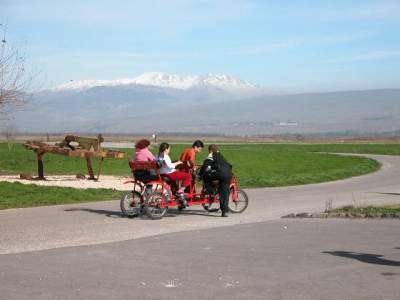 The Hula Valley, is one of the most important of them. Millions of birds – some say hundreds of millions – stop there for short period. 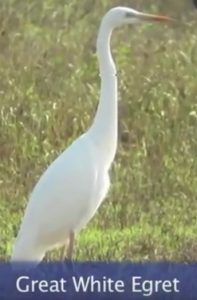 One is cautious about numbers, but is specific about some of the migrant visitors to the Hula: 90,000 cranes, 60,000 pelicans and 600,000 storks. 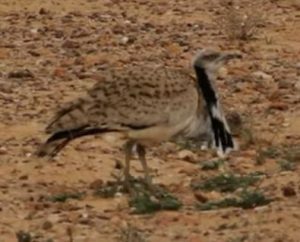 Numbers of smaller birds are less exact but amount to many millions. 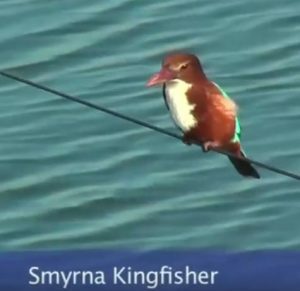 “This is really a unique place,” The Hula is unequaled in the number and variety of birds that visit. Bird watchers point out several migration routes: Birds going from Western Europe to North America stop in Panama and Costa Rica. Birds flying from Western Europe to Africa stop in southern Spain. And those migrating from Eastern Europe, the Baltic states and even Scandinavia, stop in Israel. Statistics indicate more birds visit Israel than Spain. Smaller “refueling” stations may also be found in Cyprus and Malta. 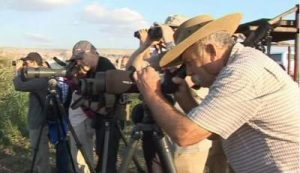 The experts coming for the conference includes Marco Lambertini, the head of Bird Life International, an umbrella organization for more than 100 bird-watching associations around the world whose goal is the preservation of birds, their homes and their biological variety – prevention of the extermination of species. Cranes in a small lake in the Hula Valley. Some 90,000 cranes, 60,000 pelicans and 600,000 storks pass through the major migratory route each year. Lambertini, who lives in London, said in a phone interview that changes in bird migration are a cause for concern and he places great importance on the Hula conference. “There has been a downward trend in the numbers of migrant birds worldwide. There are species undergoing a swift decline and it is possible to discern such a trend even among more common birds, which are not in danger of extinction but whose migrant numbers are decreasing,” he said. Lambertini says the subject is complex as the migrants pass over so many countries under difficult conditions and with great effort. Lambertini emphasizes that the national groups and the umbrella organization can offer the big picture, but not solve local problems. The national organizations cooperate with each other, he says, even when their countries do not have warm relations or are unfriendly. Mizpe Hayamim Spa Hotel local accommodation. Mizpe Hayamim offers a spa, swimming pool, and panoramic terraces overlooking Galilee. Local accommodation Booked 6 times today. 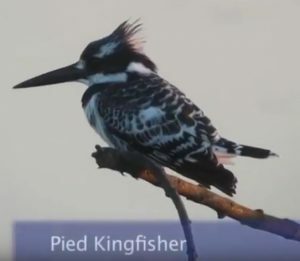 An overview of the 2011 Hula Valley Bird Festival, as told by some of this year’s participants, and a brief look at the Artists for Nature in Israel exhibition. Take A Break Holidays takeabreakholidays, Bird Watching Accommodation.